TPSF started in a way most great things do — by accident. 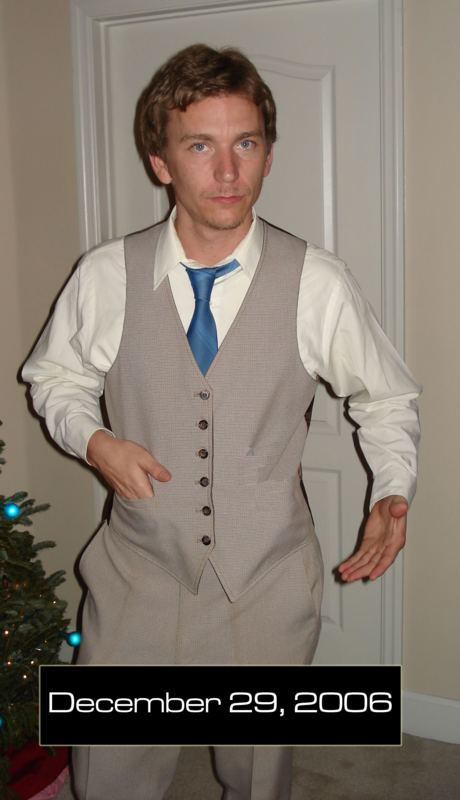 On a cold December day in 2006, a noble, brave young man (Donald) decided to go against the norms his friends had set forth, by dusting off his grandfather’s vintage three-piece suit from the 1930s, to wear for his friend’s (Cameron) birthday celebration. While first taken aback by this dapper decision by Donald to wear such a finely-threaded suit out that evening, the friends began to admire and later envy the matching vest, jacket, and pants, as well as his coordinating tie. Two days later, this same group of individuals went out and played a random game of tackle football in a field littered with dog poop and other unidentifiable objects. With the memory of the dapper suit still fresh in their minds, one of those present proposed an idea..
“Why don’t we play football in three-piece suits??? 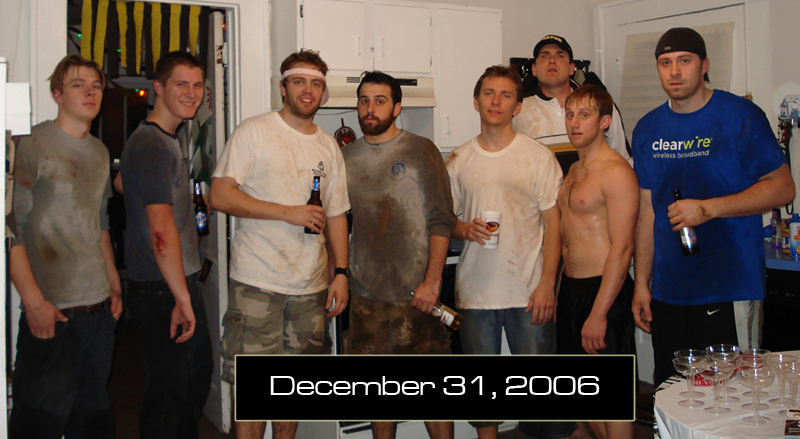 Following the conclusion of their football game that day, these friends rang in the New Year together and after went their separate ways, with little discussion of football in three-piece suits again. To this day, it is still unclear as to who initially proposed the tailored football idea that would later form the glorious amalgam of the two themes from the events that New Year’s weekend. However, in the months that followed, and unbeknownst to his friends, Cameron continued to ponder the idea of what such a game would entail. 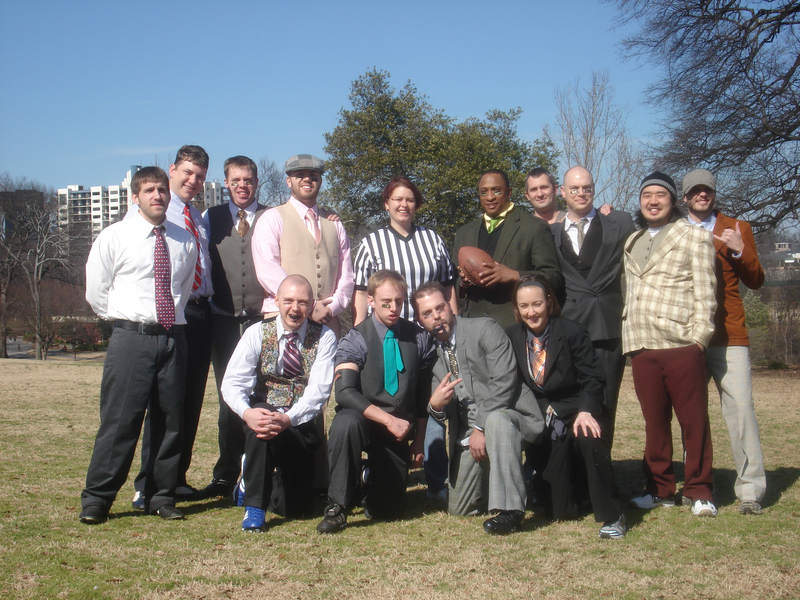 He envisioned both the hilarity of and entertainment value that a dapper game of tackle football would produce. While he was unclear exactly how a finely-threaded game would actually play out if made a reality, he did believe that a game of such magnitude should be played during one of the biggest weekends in sports – Super Bowl Weekend. Unfortunately, given his friends lack of further discussion of the tailored football idea, and for fear of ostracism for pursuing such an outlandish concept, he decided not to propose the three-piece suit football game until several years later. Fast forward to early January 2009 and a little over two years since Donald wore his infamous three-piece suit. Several of these same friends were out celebrating another friend’s birthday. With Super Bowl weekend looming in just a few weeks and for fear that another opportunity to play the tailored football game would pass, Cameron finally built up the courage to propose the idea to those present. To his surprise, not only did those present agree to participate, they fully embraced the idea – which in a few weeks time would launch the journey of TPSF! The first TPSF game was a huge success and the players (and handful of spectators) that were present were already excited for the next TPSF at the conclusion of the first one. As the next few TPSF games continued to grow in interest and excitement, the TPSF group decided to use the game as a platform to help those in need. Befittingly, with several current TPSF players (or close relatives) active military and/or veterans, TPSF decided to make its mission to support veteran-related causes with the event. In every game since 2012, TPSF has been played to support those who have fought for and protected those rights which have allowed us the freedoms to even have a Three Piece Suit Football Event. Around that same time (Fall 2012), Cameron moved to Boston, MA to finish his doctorate through working at the VA Hospital. While living there, he befriended a group of sports enthusiasts in the Brighton, MA area who shared his same passion for football and also supporting veteran-related causes. Having seen pictures of the TPSF event that he flew down to Atlanta for each Super Bowl weekend, they finally asked him, “Can we start a chapter here?” Without hesitation, the answer was “yes” and the Boston Chapter was born in 2014. TPSF Boston is played annually in the Fall and currently supports, Operation Delta Dog. With the Atlanta event now playing it’s 11th annual game, TPSF is “Atlanta’s longest running ‘Big Game’ weekend event!” Click here to get the details on TPSF XI upcoming on 2.2.2019!